By David Steele, General Secretary. “And there were shepherds living out in the fields nearby, keeping watch over their flocks at night. An angel of the Lord appeared to them, and the glory of the Lord shone around them, and they were terrified. But the angel said to them, ‘Do not be afraid. I bring you good news that will cause great joy for all the people’” (Luke 2:8-10, NIV). I recently received a text message from my 21-year-old daughter, Aubrey, who has Down syndrome. She told me that there were going to be thunderstorms at home and clarified, “Dad I hate storms rain.” As I have done many times before, I assured her that everything would be okay. “Do not be afraid” are the words of comfort that parents offer their children as they hold them tightly through the thunderstorms of life. These words sometimes come easily with little forethought. Yet, as we hear about the hurricanes, flooding, and fires that have displaced many; the tragedy of a mass shooting; a medical diagnosis with an uncertain prognosis; or the death of a loved one, it is more difficult to find comfort or assurance in these words. We continue to face those storms within our church as well: diminishing attendance and the possibility of having to close the doors; a long, tiring search process for a new pastor; changes that test the boundaries of our traditions, values, and biblical interpretations; finger pointing and conversations about the possibility of a split; the spread of misinformation; and broken relationships within the fellowship. These things give us great concern and can distract us from hearing the good news. Living in the plains of Kansas while in college, I was fascinated by watching a thunderstorm develop many miles in the distance clouds billowing into the heights of the heavens and lighting bolts dancing from the sky to the earth. Of course, my fascination was replaced with fear as the severity of a storm increased and moved closer, especially with the uncertainty of how powerful the storm could become. It may be hard to hear the good news in the midst of our storms, especially when they have caused damage or great harm to us and those we love. Yet the good news is present for us and, in some cases, we represent that good news for others. As followers of Jesus, we carry that good news. As a church, we are at our best as we offer comfort and assurance to one another and to all those who fear the storms of life. We are at our best when we reach out to those who have suffered great loss due to the physical storms that have stripped them of their homes, belongings, and sometimes loved ones. Through our acts of service and grace, we also convey the good news to those who do not know Jesus. More than 300 youth, young adults, and advisors served in 19 workcamps. 734 “Gift of the Heart” kits (for schools, health, or clean-up) were assembled or donated at National Older Adult Conference for Church World Service. The Disaster Ministry Response team of Ekklesiyar Yan’uwa a Nigeria (EYN, the Church of the Brethren in Nigeria) provided eight food distributions which fed more than 300 families on each occasion. Children’s Disaster Services sent 153 dedicated volunteers to 13 locations affected by disaster or trauma and cared for more than 2,328 children. 45 Brethren Volunteer Service volunteers faithfully served around the world. Friends, “we (as the Church of the Brethren) hold an inexhaustible cup of cold water, water that can assuage the need of a thirsty world. We possess the cup, we are the cup, we know what it contains, and because we’ve experienced firsthand its wonderful promise we can pass it on. If we can accept and live this single metaphor, we and our work cannot fail, and will not end” (Reflections on Brethren Image and Identity, adapted). This Advent, as we anticipate the birth of the one who will bring great joy for all people, may we together be the cup, share the good news, and be a source of comfort through the storms of life. Learn more about the ministries of the Church of the Brethren at www.brethren.org or support them today at www.brethren.org/give . As a church committed to peace, we should find the National Security Strategy (NSS) released by the Trump Administration today deeply concerning. This strategy, typically released every four years, addresses the priorities of the president as they relate to security issues- including the military, humanitarian aid, and any other facet of public policy that is deemed to have an impact on the security of the nation. The concerning elements of the NSS are not unique to the current presidential administration. With each new President and each new security strategy, we see values and worldviews that are inconsistent with an ethic of peacebuilding. While this blog post is in reference to the most recent iteration of our nation’s strategy, we remain opposed to all of the military-focused strategies that have made up our national security policies in the past. One of the concerning elements of this National Security Strategy is that it positions other nations as competitors. While unveiling the plan, President Trump noted that “America is in the game, and America is going to win.” The text of the NSS itself suggested that the United States must start viewing conflict as “an arena of continuous competition.” Viewing national security as a zero-sum game and pitting the U.S. against other countries is not conducive to the peaceful existence we desire for all of humanity. Adversarial relationships with China, Russia and other increasingly powerful nations will only fuel unnecessary economic and military conflict that will impact both Americans and communities around the world. We appreciate the NSS’s inclusion of language surrounding the importance of empowering women and youth, but are disappointed that they have emphasized military might and defense spending over the programs and policies that can address root causes of violence. As Christians, and especially as members of a historic Peace Church that has consistently opposed violence, it is essential that we hold our government to high standards as it sets out the national security agenda. National security should not be our highest priority- instead, our highest priority should be following the call of Jesus. The tone of this National Security Strategy contrasts starkly with the principles laid out in the Sermon on the Mount. As an alternative to the priorities set out in the National Security Strategy, we suggest increased attention to diplomacy, civilian protection, conflict mitigation, and development assistance instead of increased militarization of our approach to national security threats. We urge the United States government to adopt a peace-focused worldview, and to consider the important role of the United States in modeling such a worldview as it carries out its national security duties. 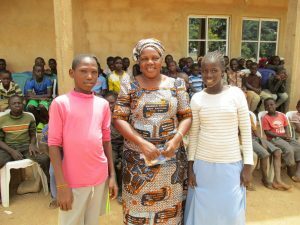 Nigeria Crisis Response has been sponsoring the Favored Sister’s School in Jos, Nigeria since January 2015.The school was founded by Na’omi MANKILIK along with a Nigerian women’s organization called Favored Sister’s Christian Fellowship. The school was started for the many orphans and displaced persons that resulted from Boko Haram insurgency. At first, 60 orphans were housed on the large piece of property and an addition 60 students were picked up daily and brought to the school. The first classes went from pre-school through 6th grade. The school has since expanded to 263 students, pre-school through high school. 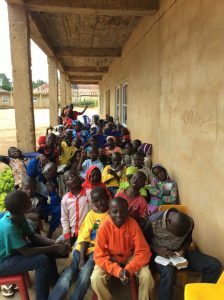 There are now 240 orphans living at the school. Favored Sister’s School has been working hard to bring quality education to these students. It employs displaced teachers and has a pastor and wife that live with the orphans. There is real care for the whole student, physically, mentally, and spiritually. Christian Aid Ministries (from Ohio) (CAM) has partnered with Church of the Brethren and has another program in place in Nigeria. When they visited Favored Sister’s School, they began to wonder what the older orphans would do when they left school. They have started a program on the orphanage property to teach these youth an occupational skill for the future. Tailoring, Shoemaking and Carpentry will be taught as a 12 month course. Skilled locals have been employed for each trade and they teach a half day course (3) days a week. The program is well underway. The sewing class has moved from practicing on paper to sewing outfits for themselves. Shoemakers have made and sold over 40 pairs of shoes. 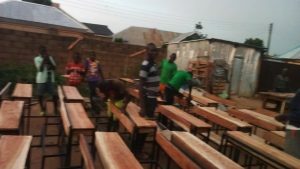 The carpenters made 40 desks for the school and are now making couches they can sell to help run the school. Thank you CAM for the dream and for helping it come to fruition. For less than $150 per youth, you could help sponsor the program. The students will be able to learn a vocation and then will graduate the program with a sewing machine or the basic hand tools of their own that will equip them to support themselves. Check can be made to Church of the Brethren, with Nigeria Crisis – Favored Sisters in the memo line. Please continue to pray for the students, teachers and administrators of Favored Sister’s School. The following blog post is based on the report “Peacebuilding and Violent Extremism: Key insights and lessons from a global consultation convened by Peace Direct.” You can find the report here. 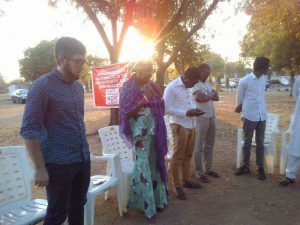 As the convener of a working group on Nigeria, the Office of Public Witness works with a number of peace-focused organizations. One of these organizations is PeaceDirect, an “international charity that works with local people to stop violence and build sustainable peace.” In 2017, PeaceDirect convened experts from 36 different countries in a series of peacebuilding discussions focused on violent extremism. The result was a report entitled “Peacebuilding and Violent Extremism.” The collection of insights and expertise from local peacebuilders around the world is incredibly helpful as we develop a peace-focused worldview. One insight from the discussion is the necessity of local engagement in peacebuilding processes. Too often, the international community is quick to step into violent conflict situations with ready-made solutions and top-down approaches to resolving problems. To build a lasting, sustainable peace, however, requires a much deeper engagement from the local communities. One practical way to engage local communities, especially youth and women’s organizations, is to allow them to design their own peacebuilding programs rather than funding them to carry out programs that have been already designed. Rather than serving as contracting organizations, then, these international organizations would be directly empowering local communities to find and sustain their own long-term peacebuilding initiatives. Another key takeaway from the report was the importance of working towards an ideal version of the world, rather than a pragmatic one. As peacebuilders- and especially as people of faith- it is our job to guide the world closer to the best that it can be, rather than making the kinds of compromises common in the policy world. An overarching theme to the discussion was the importance of language, and how the ways that we frame conflict with our words has real-world implications for the way conflict situations are perceived globally. Nora Lester Murad articulated this most clearly when she said, “Those who control the discourse are able to frame certain questions in or out, to make certain ideas normal or extreme, and can use the legitimacy they gain from controlling discourse to marginalize certain voices.” One example of the power of language can be seen even in the term “Countering Violent Extremism,” which has been used primarily for actions against Islamic actors and not in reference to other extremist groups- for example, right wing hate groups. The Office of Public Witness is grateful to wonderful peacebuilding partners like PeaceDirect for their work around the world. Insight from local, grassroots peacebuilders is essential to forming a peace-based worldview that takes into consideration multiple perspectives. As we seek to “live the peace of Jesus publicly,” we will continue to collaborate with and listen to the grassroots peacebuilders actively working to make the world a better place. Justice is coming! It is Jesus. Anticipation. Waiting. Agonizing? Uncertain. Advent—waiting for the promised One. On Thursday, while I was in northeast Nigeria, we rose early for our 3-4 hour drive and hit the road. Rutted. Through dry, mostly flat land with low trees except for the palms. Security checkpoints with men with big guns and barricades. Road blocks of barrels or tires or logs at checkpoints which jut, maybe half way, into the road. These alternate—one from the left, right, left, right—which slows traffic. This traffic slowing strategy is also used through villages which are lined with market stands. This works-sort of- but at times it generates a certain careening as cars coming opposing directions navigate as quickly as possible. While we barreled through one such obstacle course a gas tanker kept pace with us leading our way, weaving wildly, looking a little like the Joker in Batman driving the tractor trailer. Then, passing Gombi, we tighten a bad sounding wheel before engaging the long smoother straightaways (regularly hanging at 85 miles an hour) to Yola and the airport. As a mere passenger rather than driver, I wait. Bracing myself, observing, talking—but waiting. So, when the Office of Public Witness works with the Nigerian Working Group which we convene on military accountability and human rights, raising concerns about the sale of weapons by the US, it is not an abstract thought. It is not a sterile appeal to theoretical legal frameworks, which are useful and regularly used, but it is because we follow a God who feels the pain of people and calls us to a ministry feeling this pain—and then acting in response. God’s patience is for repentance. God’s patience is for repentance. 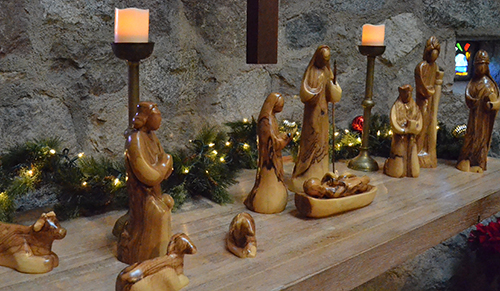 Jesus, the one whose birth we anticipate in advent, is the embodiment of this justice. 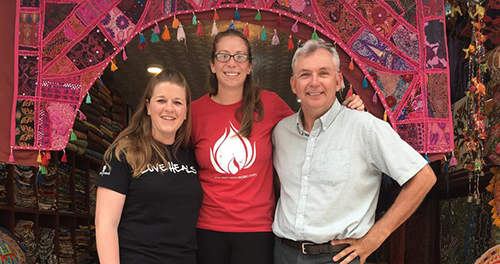 Emily Tyler, Alexis Charles, and Jay Wittmeyer at the Nepal workcamp. My family has a tradition on Thanksgiving Day of going around the table two or three times and making a list of the things we are especially thankful for in the past year. This list is a testimony of the goodness of God manifested in our lives. We like to compare each year to the previous year and we like to receive these lists from others. “Thankful for acceptance to college.” “Thankful to be cancer-free.” “Thankful for camp counselors.” “Thankful for our new puppy.” I have said in the past, and will say again this year: I am thankful for the privilege to work for the Church of the Brethren. Work for the church is not always easy, but it is immensely gratifying. Several of my journeys this past year stand out as significant. In January I joined a heads-of-mission delegation to Cuba with Church World Service to meet key leaders in Cuba and talk about US-Cuban relations. 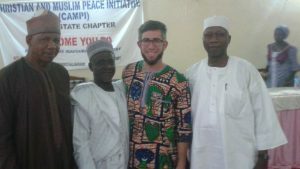 In April I was invited to preach at the Brethren annual gathering in Nigeria and traveled to Chibok to meet Brethren families and talk about life under the constant threat of violence. In May I visited a new Church of the Brethren ministry in Rwanda and heard my first Twa-Pygmy choir sing, dance, and drum in a Brethren congregation. In June I co-led a young adult workcamp to Nepal with Emily Tyler to reconstruct a school damaged by the earthquake. And in October I met families participating in dairy projects in Tanzania with Heifer International and heard powerful stories of how “passing on the gift” has transformed their lives. Looking back, I also am reminded of the many places I was unable to visit. I wanted to visit Venezuela, but it takes two months to get a visa. Venezuela is collapsing economically but, ecclesiastically, a number of congregations have a visionto form a new movement based on Brethren ideals of peace, community, and service. 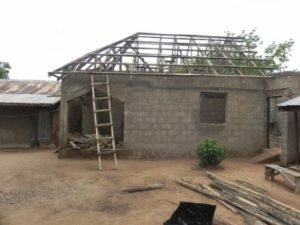 I also was unable to consecrate a new Brethren church building in Ngovi, Democratic Republic of Congo, since violence spread too widely and quickly at the time of my journey, hindering my travels. Heavy on my mind has been the work of the Brethren Peace Center in South Sudan. The center was looted by government forces in June. However, after much prayer and careful consideration of the state of unrest, Brethren mission worker Athanasus Ungang decided to return to Eastern Equatorial, South Sudan, and press on with his call to preach, disciple, and promote peace through trainings and workshops. The Church of the Brethren purchased a Land Cruiser two years earlier, but war prevented us from shipping it into the country. 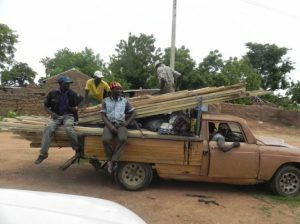 We believe now is the right time to send that vehicle to expand our work. There is a strong need for peace witness in South Sudan. The Global Mission and Service program of the Church of the Brethren often works in unusual ways and in difficult situations, but we don’t think of it in that way ourselves. What seems challenging, dramatic, even peculiar to the average American, is quite normal for a church community seeking to be faithful disciples of the Prince of Peace. When new acquaintances ask me about my work, I typically refer to some of our areas of focus, our programming, and then some countries where we are working. As I mention places with much conflict like Venezuela, Democratic Republic of Congo, North Korea, Haiti, northern Nigeria, and South Sudan, quite frankly, jaws drop and I often receive very puzzled looks. Global Mission and Service is not intentionally seeking to be in the “hard places” of the world, but is simply trying to be faithful to God’s leading and embody the church as doors open for us. I am very thankful to serve in a ministry that truly seeks to be the salt and the light of the world. I would encourage you to write a list of the things from this past year for which you are thankful and to celebrate this testimony of God’s goodness to you. I would then challenge you to “pass on the gift” so that others may also be blessed. Thank you for praying and supporting the Church of the Brethren. Learn more about Global Mission and Service today at www.brethren.org/global. Support this and other ministries of the Church of the Brethren at www.brethren.org/give . As we know, many of the Ekklesiayar Yan’uwa a Nigeria (EYN) churches were destroyed by fire during the Boko Haram insurgency. Many homes were also burned and destroyed. 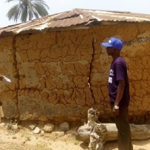 EYN Disaster Team has been working to re-roof the houses of the most vulnerable. Now that it is dry season, the housing repairs are in full gear. 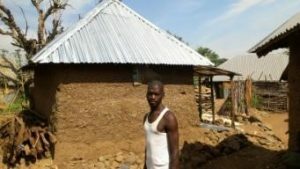 57 homes were recently re-roofed in some remote areas. Those who benefited from the repairs are extremely grateful.